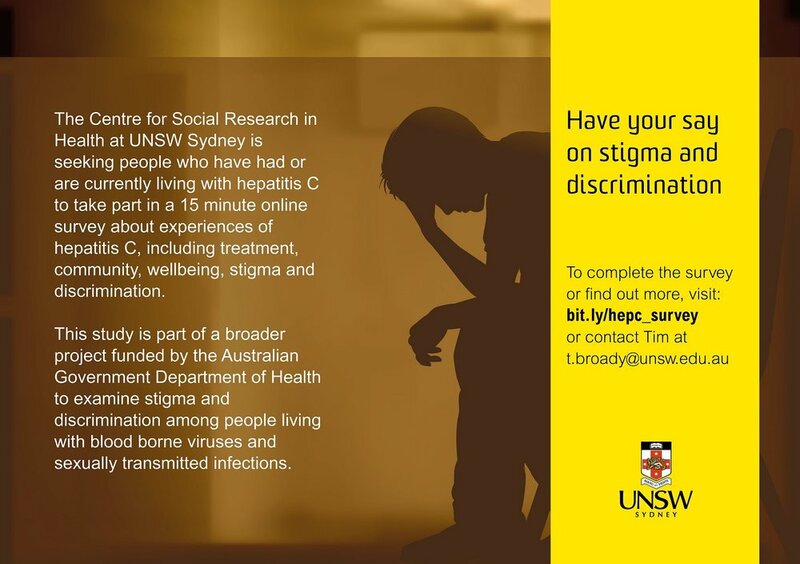 If you are over 18 and living with or have previously had hep C in Australia, tell us about your experiences of living with hep C.
The Centre for Social Research in Health at UNSW Sydney is seeking people who have had or are currently living with hepatitis C to take part in a 15 minute online survey about experiences of hepatitis C, including treatment, community, wellbeing, stigma and discrimination. Uptake of new hepatitis C treatment. The Kirby Institute is releasing regular reports on the number of people initiating treatment for hepatitis C, using the new generation medicines. The new generation medicines became available on the Pharmaceutical Benefits Scheme (PBS) from 1 March 2016. The reports show the estimated number of people commencing the new medicines generation medicines to treat and cure hepatitis C. The reports are available for download here or you can view the latest report by using the button below. Stigma stops the majority of people living with viral hepatitis enjoying the quality of life they deserve. From social exclusion and inferior healthcare to denial of employment opportunities and verbal assaults, stigma and discrimination stop people living with viral hepatitis from fulfilling their potential. According to a new report published by the World Hepatitis Alliance, more than 90% of countries surveyed reported stigma and discrimination to some degree. The report entitled “Holding Governments Accountable: World Hepatitis Alliance Civil Society Survey Global Findings Report” found that stigma not only affects an individual’s ability to access diagnostics and treatment but also impacts their personal life, mental health and ability to work, learn and maintain relationships. Yet, despite this, very few respondents felt that their government was effectively addressing it on a national level, making stigma and discrimination a significant barrier to the elimination of viral hepatitis. As a community, we must come together to challenge misconceptions and be empowered to act on violations. Make a NOhep pledge - there's no excuse. The NOhep:NOEXCUSE pledge campaign is a year-round advocacy and awareness-raising activity calling on all people to stop making excuses and pledge simple actions to help eliminate viral hepatitis. Click on the images below to make your pledge today. Hepatitis Australia is a non-government, not-for-profit organisation that became incorporated in 1997. We do not provide services to individuals. To locate hepatitis services in your area visit the services page or call the Info line on 1300 437 222. Our members consist of the state and territory hepatitis organisations and other key services providing hepatitis services.